WASHINGTON, March 12 2014 - USDA researchers are testing larger breeds of “livestock protection dogs” to help farmers and ranchers in Western states cope with the rising number of wolves and other large predators. In 2013, NWRC researchers began a multi-year study to determine the effectiveness of larger, more assertive European dog breeds at protecting livestock from bears and wolves in Idaho and Montana. WS Deputy Administrator William Clay recently directed that the project be expanded to Oregon, Washington, and Wyoming. “Finding suitable dog breeds for use as livestock protection dogs against wolves and bears not only helps us safeguard livestock and the livelihoods of ranchers, but also enhances and encourages coexistence between people and large predators,” Clay said in the USDA release announcing the expansion. Researchers are importing young Kangal, Karakachan, and Cão de Gado Transmontano dogs from Europe and placing them with producers to acclimate and bond to sheep. Generally, protection dogs can weigh as much as 145 pounds, and are more independent than typical herding dogs. Julie Young, a supervisory research wildlife biologist at NWRC, said the dogs are being used in enclosed livestock pens as well as open land grazing areas. She said the project is now conducted with five producers in Montana and four in Idaho. The dogs are shipped from Europe when they are under six months old and can cost about $1,800, which she said isn’t “exceedingly more” than guard breeds in this country. U.S. livestock protection dogs can range anywhere from $200 to $1,000 depending on breed, bloodline and age, according to the Mountain Lion Foundation. As part of the study, the dogs’ movements and behaviors are monitored using global positioning system (GPS) collars and direct observation. Researchers monitor for negative behaviors in the dogs, such as aggression towards other dogs, livestock or humans, or an inability to bond with livestock. Data is also being gathered on wolf and grizzly bear activities and movements in the study areas, USDA said. Young said researchers selected breeds for import from the 33 varieties of livestock protection dogs throughout the world. They wanted dogs that were bigger than those generally used in the U.S. and assurances that the breeders they worked with specifically bred dogs for livestock protection and not for show, or for aggression toward humans or other dogs. Young said she has not observed increased aggression in the new dog breeds during the study trials. Ben Hofer, of the Rockport Colony near Pendroy, Montana, chose to participate in the study and in December 2012 received three Kangal dogs, two males and one female, to protect his sheep herd on his Hutterite communal ranching operation. The University of Utah covered the costs. Hofer said he noticed the bear population around his farm increasing over the past few years and now he is dealing with 12 to 14 bears on the 11,000 acre ranch. Before receiving the Kangals, Hofer said he was consistently losing livestock. Now, he says, “I’d highly recommend’’ the larger dogs to other producers. The Kangals are very sensitive to potential threats and have significantly deterred predators. According to the most recent National Agricultural Statistics Service (NASS) data, in 2009, predators were responsible about 39 percent of sheep and lamb losses, costing ranchers and farmers about $20.5 million that year. In 2010, cattle and calf predation accounted for 5.5 percent of the total deaths and resulted in a loss of $98.5 million. NASS numbers show that coyotes and dogs are the primary threat to cattle and sheep. However, Young said she’s heard from producers that their best dogs are being killed by wolves, when they had already been effective against black bears, cougars and other large predators for years. “Wolves can cause so much damage to a particular producer that that producer can really just lose their business,” she said. The U.S. Fish and Wildlife Service (FWS) proposed removing the gray wolf from the Endangered Species List in June 2013. 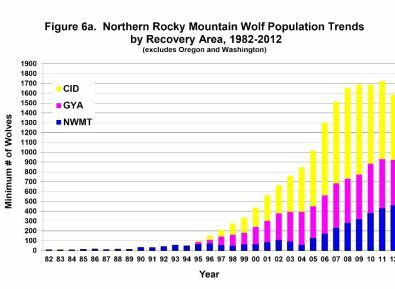 The animal has already been removed from the list in the western Great Lakes region and Northern Rockies after 30 years of government management boosted wolf populations (see chart above).